Schools break up for half term today. 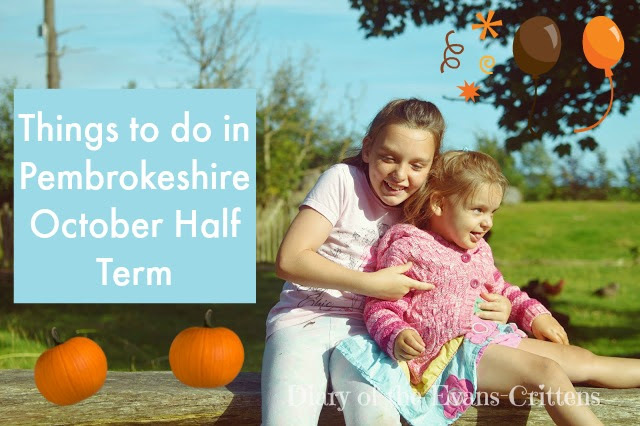 Whether you’re a local or holidaying in Pembrokeshire during the October break take a look at this post to see what’s on offer during this week. This is a long post as there are lot of activities planned in the shire. A selection of craft activities available for children: choose from creating wildlife masks, decorations, cushions, coasters and keyrings! Activities are suitable for ages 3+. These activities are self led so may require parental support. Visit The Welsh Wildlife Centre for information. Read about our Half Term Visit to the Welsh Wildlife Centre. Oriel y Parc is celebrating the coming of autumn with a Harvest Food Fayre bringing a feast of seasonal delights with an array of stalls containing local produce. Decorate your own wooden apple bird feeder. from 11am and 2pm to have a go at creating a funky feeder for your feathered friends! This activity is suitable for ages 4+. Booking is recommended, please call 01239 621600 to reserve spaces. A brand new show for 2016 featuring the voices of CBeebies’ Justin Fletcher & Nicole Davis as Pongo the Pig & Molly-Moo the Cow – from the team who brought you Marty MacDonald’s Farm! Visit Torch Theatre for more information. Travel back to ancient times to hear stories of strange adventures. Be the hero or heroine of these tales. Would-be warriors, hunters and princesses are welcome! Visit Castell Henllys for more information. Read Castell Henllys Iron Age Fort to find out about our day there. Beastly Biscuits: Decorate beastly, bone chilling biscuits in the manor House Kitchen. Book in advance. With so many amazing stories and characters to choose from, this arty workshop is a feast for the imagination. Including three creative challenges each inspired by a different story, be prepared to make something really special to take home. Booking is highly recommended for this activity, please call 01239 621600 to reserve spaces. Join Den Vaughan from the Teifi Bat Group on a fascinating bat walk around Teifi Marshes. Suitable clothes and footwear are required. Booking is essential as numbers are limited. Please call 01239 621600 to reserve spaces. Come down to the woods today and join National Trust’s Chris Harvey-Jones for a 2 hour woodland survival session at Colby and learn how to survive in our woods. Try your hand at shelter building, fire lighting, trail marking, Tracking, distress Signals, basic survival camp cooking, camouflage and concealment and much more. Call 01834 811 885 to book. Could you be a Celtic warrior? Here’s your chance to have a go! Learn the skills and art of Iron Age warfare. Expect an energetic day of fun activities for all ages! Entrance plus £1 per activity. Make an adorable pine cone owl in this craft session. Booking is highly recommended, please call 01239 621600 to reserve spaces. Are you brave enough to meet the ghosts and spirits of those who lived at Castell Henllys over 2,000 years ago? Keep your eyes, and ears, open! Who knows who , or what, may be lurking in the woods! Not for the faint hearted!! £1 per activity + admission. John Muir was the father of National Parks. His legacy is that we should discover, explore, conserve and share the wild places around us. This new family award encourages you to do just that. These sessions at different locations in the National Park will introduce you to the John Muir family award, explain how it works and give you some hints and tips to get you started on your own, fantastic John Muir Adventure. 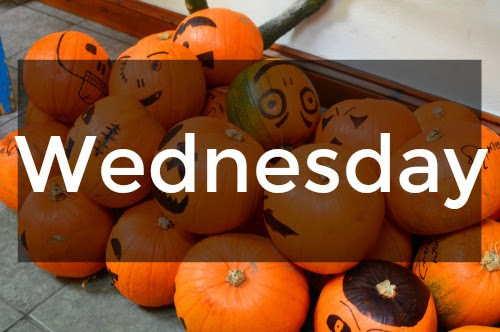 Enjoy craft activities, face painting and games with a Halloween Hoot’s theme. Beastly Biscuits at Scolton Manor: Decorate beastly, bone chilling biscuits in the manor House Kitchen. Book in advance. Meet Pant Glas birds of prey selection of awesome owls. Take part in clay modelling sessions where you can create your own creepy creatures or even base your model on one of the owls! Booking is recommended, please call 01239 621600 to reserve spaces. Booking is not required to see the owls and entry is free. Stackpole have a selection of fun to tick off in the last “50 things” event of the year. Sit around the fire and listen to tales of adventure from the distant past. Local storytellers will keep you spellbound as they weave their stories of myth and legend. Join Ghost Finder General, Howard, on an after-hours ghoulish ghost tour around Pembroke Castle, as he tells you a selection of our ghost sightings and poltergeist happenings from our 900 year history of sudden death and disaster. Meet us at the Gatehouse before 5.30pm because the gates will then be locked! The tour will last about an hour and a half, and is for ages 7 and up. Halloween costumes are encouraged, but please wear warm outdoor clothing and suitable footwear – our tower’s staircases are a chilling place at night! A torch is essential as you can only see ghosts with the help of light! Spooky stories, creepy crafts and terrifying treats. Suitable for ages 4-11. Contact Tenby Library on 01437 775151 to book. Make your own willow lantern and follow our spooky trail around the woods. Call 01646 661425 to book. Meet a wood nymph who’ll teach you how to make a fairy headdress or a wizard’s wand. Join her on a walk through the woods to gather the materials. £3 per session + admission. A range of craft activities available for children including Halloween owl decorations, charm bracelets, spooky scratch art pictures and spider finger puppets. Suitable for ages 4+. Each activity is self led so may require parental support. Booking is not required for the activities. Hunt for pumpkins containing letters hidden around the reserve and solve the anagram to win a prize! Suitable for ages 3+. Booking is not required. Spooky Art Session. All ages welcome. Fun, games and tantalizing treats. Ages 4-11. Join in Halloween Lantern making, then use your lantern to help guide yourself around the spooky nature trail. Find all the answers and claim your small prize. Follow our spooky Hallowe’en trail into the woodlands and around the farm, and get stuck in with seasonal creative activities. Free entry, £2 per trail. Over October Half Term, Pembroke Castle will be offering free Halloween tours for children! Our expert guide, Howard, will take you and your children on a tour of the Castle, and spook you with tales of witches, wizardry and ghostly sightings. Ever wondered what the difference is between witches, wizards and warlocks? How about ghost and poltergeists? Let our resident Witch Finder General tell you all as you discover what lurks in the shadows of our towers, staircases and dungeons! Visitors are encouraged to come in their Halloween costumes, although make sure you wrap up warm! Suitable for all ages. No booking is necessary, and ‘Spooks, Spectres and Witches’ is included in the admission price, or with your annual membership. 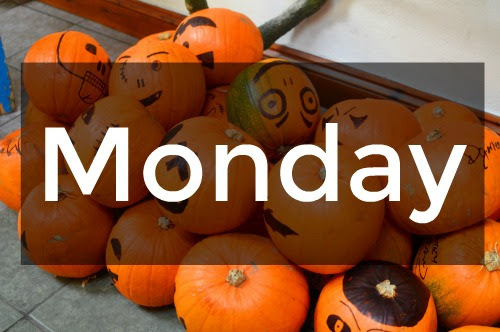 Monday 24 October – Thursday 27 October at 11:15 and 13:30. Friday 28 October – Sunday 30 October at 13:30 only. This October Half Term, once inside the castle, children can decorate and take away their own creepy cupcake or cookie in the castle café for just £1! This will run from Wednesday 26th– Sunday 30th October at 15:00 each day. Spaces are limited and work on a first-come, first-served basis. Drop in Halloween Craft Sessions at Haverfordwest, Milford Haven and Pembroke Dock libraries during library hours. 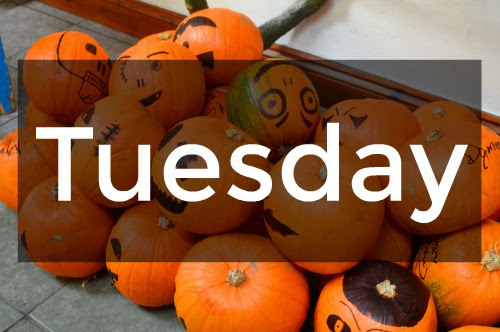 Drop in Halloween Craft session also at St David’s Library on Tuesday and Thursday. 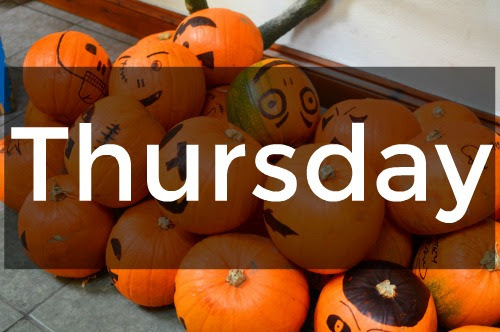 Take on the Halloween Treasure hunt and win a Chocolate Pumpkin during library hours. From the creators of Shrek comes the most smart, funny, irreverent animated comedy of the year, DreamWorks’ Trolls. Head to Picton Castle where it is said monsters lurk in the 40 acre gardens, and there will be Halloween craft workshops and spooky tours with a magical twist. No sacrificing of animals, or offerings of fruits and vegetables to the spirits, just lots of glue, sparkle and family fun – with of course, the opportunity to dress up which we actively encourage! Visit Picton Castle for more information. Carew Castle is home to many ghosts! Keep your eyes peeled for spooky sightings as you explore creepy corridors and terrifying towers, find all the ghosts and receive a fiendish prize…. Settle around the fire in the Lesser Hall as a costumed storyteller recounts spooky tales and stories of brave knights and beautiful princesses. Included in normal admission. Ages 4+. Children must be accompanied. Ghouls just wanna have fun at Carew Castle this half term! Mischief and mayhem abound with fangtastic activities and games. Wear a spooky costume for a costume competition at 3pm! Normal admission plus £2.50m for activities. A opportunity to meet a variety of birds of prey at the castle …why not hold a bird for just £1? £5.00 Adult, £4.25 Concession, £3.50 Child. Ages 5 and over only. Wear warm clothing, bring a torch. To book places (where recommended) please call 01646 651782 or email enquiries@carewcastle.com. Join in with this Halloween treasure trail around the centre and grounds and receive a spooktacular goody bag at the end as your reward. Visit Oriel y Parc for more information. While in St David’s you could fit in a visit to St David’s Cathedral too. The Hangar has been taken over by ghosts and ghouls! It will be transformed into the stuff of nightmares. There will be a range of activities taking place with prizes to be won. 11am -8pm (Check opening hours of day you visit). Visit Hangar 5 to book online. Manor Wildlife Park are hosting a half term full of halloween activities including face painting, activity sheets, treat stations, photo opportunities, ghost hunt, carve your own pumpkin, the horrible parade led by mummified Rosie the ring necked lemur, and vamped up Ronald the red ruffed lemur, delicious spooky treats in the cafe and a haunted house to remember. For up to date information please visit: Anna’s Welsh Zoo . Read Fifteen Reasons why we love Manor Wildlife Park . 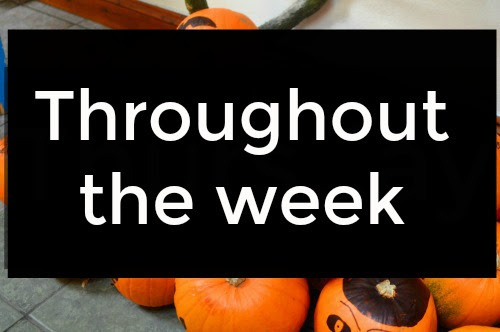 Something spooky is going on this week at Folly Farm, join them if you dare! 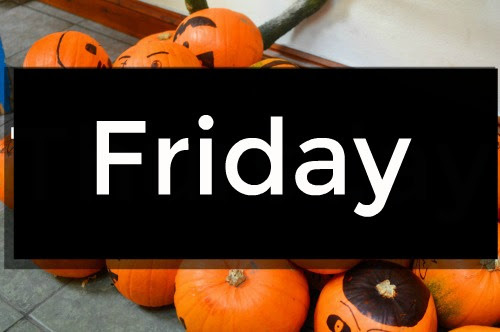 Celebrate Halloween with meet and greets, freaky facepainting and spooky prize trails and card hunts. 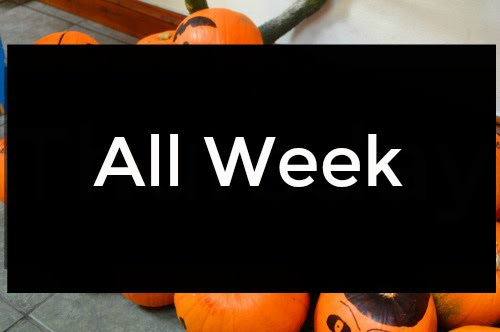 Spooky Halloween will take place during the whole of half term. Open 10am -5pm every day. Adult: £13.95 Child: £11.95 Concessions: £11.95 (save 10% when you buy tickets online). For up to date information visit Folly Farm. Read about our Fun Filled Family Day at Folly Farm. Spooktacular Storytelling, tantalising tales at 11am, 2.15pm and 3pm (spaces limited). Tuesday and Thursday only: Beastly Biscuits: Decorate beastly, bone chilling biscuits in the manor House Kitchen. Book in advance. Follow the trail, work out the clues and win a prize. £1 per child. Visit Scolton Manor for more information. Read about our Scolton Manor Half Term Day Out. Free but admission charges apply. The Palace are showing Storks, Trolls and Dr Strange over half term. See their website for days and details. Pembrokeshire Leisure Centres hold activities throughout half term in addition to swimming and fitness activities. Take a look at the October half term timetable for your local leisure centre. Centres can be found in Milford Haven, Haverfordwest, Crymych, Fishguard, Pembroke, St Davids and Tenby. Look out for Tenby ghost Walks taking place during half term too. See the full timetable here. I hope you find this list helpful. Let me know if there are any event to add to the list. Have a great half term holiday in Pembrokeshire!